An Economic and Financial Crimes Commission (EFCC) investigation officer, Tosin Owobo, yesterday testified that three former Nigeria Air Force (NAF) officials allegedly diverted N21 billion to their personal accounts from NAF’s. He said they diverted the cash through several companies, which they registered personally. None of the companies had any transaction or contract with NAF, he claimed. Owobo was testifying in the trial of a former Chief of Air Staff, Air Marshal Adesola Amosu (retd), former NAF Chief of Accounts and Budgeting Air Vice Marshal Jacob Adigun and former Director of Finance and Budget Air Commodore Olugbenga Gbadebo. They were arraigned before Justice Mohammed Idris of the Federal High Court in Lagos. EFCC accused them of converting N21billion from NAF through various companies. The companies are: Delfina Oil and Gas Ltd, Mcallan Oil and Gas Ltd, Hebron Housing and Properties Company Ltd, Trapezites BDC, Fonds and Pricey Ltd, Deegee Oil and Gas Ltd, Timsegg Investment Ltd and Solomon Health Care Ltd. Led in evidence by prosecution counsel Rotimi Oyedepo, Owobo said N5.9billion was transferred from NAF’s accounts to Delfina Oil and Gas. He said after the money was converted to dollars, it was handed over to Gbadebo, who took it to Adigun, who in turn took it to Amosu. He said Mcallan Oil and Gas received N6.1billion from NAF. Trapezites BDC received N3.6billion. Owobo said Deegee Oil and Gas received N800million from NAF accounts. Timsegg got the same amount. “These companies were not into oil and gas. The N21billion was moved from various NAF accounts without appropriation,” he said. Owobo said Adigun admitted during interrogation that he opened Delfina Oil and Gas’s bank account and ran it and the others. “There was no contract of memorandum of understanding between Delfina Oil and Gas and NAF,” he said. The witness said Adigun incorporated Mcallan Oil and Gas and opened its bank account, which he also operated. “There was no service rendered to NAF by the company,” he said. Owobo said Deegee Oil and Gas’s bank account, which was also allegedly used to divert funds, was operated by Gbadebo..
“He controlled the account which received funds from NAF. There was no contract or MOU between them, and no service was rendered by Deegee Oil and Gas to NAF. “Timsegg Investment also belongs to Gbadebo. There was no service rendered by Timsegg to NAF,” he said. Owobo told the court that Adigun owns Hebron Housing and Properties, which also received funds from NAF, despite not rendering any service to it. According to him, all the accounts had a single accounts officer, Mrs Funke Osinsanmi, at the bank where they were domiciled. The EFCC operative said the account officer would receive instructions from Gbadebo, liaise with various Bureaux de Change operators to convert the sums to dollars, and hand them over to Gbadebo and other NAF “bank runners”. Owobo said the banker introduced the owner of Trapezites BDC to Adigun, who eventually sold the company to him. “We interviewed Adigun who confirmed to have received dollars from Gbadebo. He said he received instructions from Amosu on what the dollars were to be used for. Some were handed over to him (Amosu). 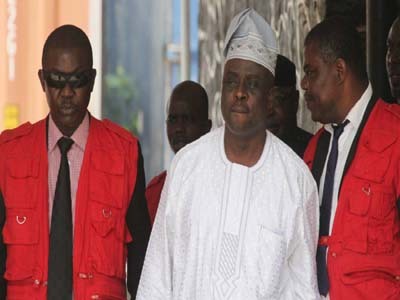 “We interviewed Amosu and he confirmed to have received dollars from Adigun and that all operations and financial transactions were carried out by his instruction to the director of finance, and that all the withdrawals from the NAF accounts were made via instructions from him,” the witness said. Owobo said the funds transferred from NAF accounts were not part of the defendants’ salaries or allowances. “The funds in these company accounts were not their salaries. The funds came from various NAF operations accounts which receive funds from CBN for general operations. These were not their salary accounts,” he said. Owobo said some of the funds from Hebron Housing and Properties were used to acquire properties for the defendants. He said a developer, Babatunde Omolehin, of Canon Projects, told EFCC investigators that he met Adigun who informed him that he owned Hebron Housing and Properties. He (Omolehin) subsequently received N1.4billion from Adigun to develop some properties from him. Owobo said the properties include 40A Bourdillion Road, Ikoyi, which is of 300 square meters; 12 blocks of flats in Parkview Estate, and another 12 blocks of flats on Victoria Island. “The properties were not purchased in the name of NAF but by Adigun. He also purchased the properties in Abuja,” he said. Owobo said over N600million was transferred to a company, Right Option Oil and Gas, for the purchase of two properties in the United Kingdom through Adigun’s brother. According to him, the company, in turn, transferred about $3million to UK for the properties, which he said were not bought in NAF’s name. “They were for Amosu and Adigun,” he said. Owobo testified that N2.1billion was used to purchase diagnostic equipment from General Electric for Solomon Health Care, allegedly owned by Amosu. He said General Electric confirmed receiving the funds from Solomon Health Care for the equipment, and that the money was transferred from Delfina Oil and Gas. Owobo said so far over N2billion had been returned to the Federal Government by Amosu. Some properties, he said, have been temporarily forfeited.